Hip arthroscopy is a minimally invasive surgical procedure where a small camera and special instruments are placed into the hip through very small incisions. The surgeon is able to look into the joint through the camera with the help of a TV monitor. 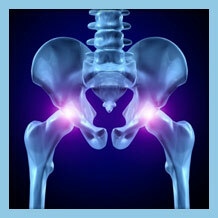 The hip joint consists of the femoral head and the hip socket within the pelvis called the acetabulum. The joint itself is deep under many muscle layers. Hip arthroscopy is a revolutionary new procedure that allows the surgeon to correct abnormalities within the joint without the need to perform deep invasive dissections or dislocations of the hip. Arthritis of the hip from the wear and tear associated with recreational activities and daily life can be diagnosed at different stages of the disease. Two pathological variances of early arthritis are typically seen: CAM impingement [due to bone spurs on the femoral head and neck] and PINCER impingement [due to a socket that is excessively prominent from bone spurs]. These two entities are collectively referred to as types of Femoroacetabular impingement. Hip arthroscopy can be useful in treating these conditions possibly delaying or eliminating the need for very invasive hip replacement surgery. Other conditions that may be treated with hip arthroscopy include hip impingement, labral tears, dysplasia, loose bodies, synovitis, trochanteric bursitis, and snapping hip syndrome. The procedure involves repairing cartilage, trimming bone spurs, and removing loose bodies among others. Hip arthroscopy can be done as an outpatient procedure depending on the overall health of the particular patient.